We work closely with companies and individuals ensuring constructive partnerships that work for the benefit of children in India. We appreciate the efforts of the companies and individuals who have associated with us and supported us. We encourage companies and individuals with philanthropic values to partner with us, so that together we can fight dual issues of hunger and illiteracy among children in India. There are many opportunities that individuals and businesses could explore with us and partner with us for. Read about some of our latest partnership campaigns! LITTLEOPIATM – a kidswear apparel brand promoted by Chimera Threadkraft Pvt Ltd. This brand has been recently launched to cater to the kids’ luxury occasion-wear segment. The company will sponsor one meal for every Littleopia garment sold, to contribute in creating a hunger-free environment for underprivileged children, help them learn well and excel, and thus build a better future for India. Waytoindia a customized tour options provider to the discerning tourists in India is supporting Akshaya Patra by placing our banner in their blog site and promoting Akshaya Patra on their facebook page. Britannia Good Day has partnered with Akshaya Patra to spread smiles this World Smile Day. For every smile uploaded on their web page or Facebook, Britannia Good Day will give away a packet of delicious cookies to a child. GOOD FOOD FOR GOOD, a Toronto based social enterprise committed to making a difference recently partnered with Akshaya Patra and have been donating a meal for every sale they made, helping us bring unlimited food for education. With this Good Food For Good intends to join in the fight against world hunger. Jackfruit365 was a creative initiative taken by James Joseph to make Jackfruit available to the public 365 days of the year, with three main objectives – bring down the wastage of the highly nutritious fruit from its current level of 80 percent; provide a native solution to increase the fibre content of an average professional’s diet; and create a vehicle to support mid-day meal programmes and help bring more children to school. JackFruit365 would in turn contribute to Akshaya Patra in three ways - for every pack sold, the JackFruit365 team would donate a sponsorship fee for 5 mid-day meals; request their partners (restaurants and corporate cafeterias) for every meal they serve with JackFruit365, to donate for one midday meal; and finally, request all their well-wishers to donate generously to Akshaya Patra and help bring poor children to schools. Kavita Vision has chosen to support Akshaya Patra by donating one per cent of each online sale from its ventures Radhavallabh.com and Krishnastores.com towards the mid-day meal programme. The organisation exports original, handcrafted products for deities and deity altars to temples and individuals worldwide. They also provide devotional information on God through editorial write ups and free online services. Named ‘Annadaan’, this initiative aims to spread awareness of selfless service through their Radha Krishna Spiritual Store and Radha Krishna Spiritual Portal. MyCopie, a stationary brand for students, has partnered with Akshaya Patra to do their bit to feed hungry children across India. To accomplish this, for every notebook sold, MyCopie is donating a part of their revenue to the Foundation, so that children do not have to forego their education due to lack of food. PriceBurp.com, one of the most eminent coupon based website in India has partnered with Akshaya Patra through a charity plan. According to this, every time people shopped online and made qualifying sales using PriceBurp coupons, they would donate a mid-day meal to the many underprivileged school children across India, thus helping our efforts to curb the malnutrition and hunger related issues in our country. Saavn, India’s No.1 digital music service, has partnered with Akshaya Patra to launch #MusicForMeals with the goal of feeding 5,000 children mid-day meal on every school day for an entire year! For every hour of music streamed via their website on apps, Saavn will donate towards one Akshaya Patra mid-day meal for one child. Swiggy, a food ordering and delivery company and The Akshaya Patra Foundation has teamed up this Independence Day with an initiative, ‘Freedom from Hunger’. With the motive to free children from hunger and illiteracy, this initiative will help raise funds for 200 children, who will be fed for a year. For every order placed on 15, August 2015, Swiggy will donate Rs. 15 towards Akshaya Patra. By ordering food online via Swiggy and one can make a difference in a child’s life. Unlockar is an android app that delivers exciting, user preferred content on phone's lock screen and rewards you every time you unlock your phone. It recently collaborated with Akshaya Patra and run the campaign # Akshaya Patra's 'Feed One Child' Initiative promotion during June-July 2014. It rewarded its users with real value benefits which based on user's choice could also be donated to Akshaya Patra. 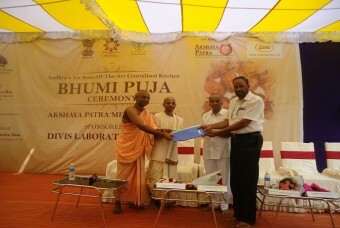 Vasudev Adiga’s ‘+1 Campaign’ was another imaginative example of how an organisation can partner with Akshaya Patra. In this campaign, every item on the Vasudev Adiga’s menu was increased by Re 1, and the proceeds were donated to Akshaya Patra.